The long-awaited film will arrive via Netflix in March. 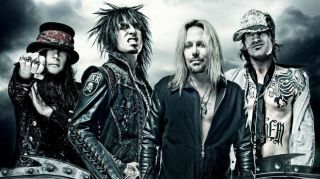 The Motley Crue film based on their 2001 biography, The Dirt—Confessions of the World's Most Notorious Rock Band has received an official release date. The Dirt was directed by Jackass’s Jeff Tremaine, and stars Daniel Webber as Neil, Douglas Booth as bassist Nikki Sixx, Machine Gun Kelly as drummer Tommy Lee and Iwan Rheon as guitarist Mick Mars, as well as Tony Cavalero as Ozzy Osbourne and David Constable as former Crue manager Doc McGhee. This past summer, the band members also revealed that they were in the studio recording new music with producer Bob Rock, who helmed the band’s 1989 album, Dr. Feelgood, as well as their 1994 self-titled effort. That music was eventually confirmed as four new songs for the movie. Motley Crue wrapped their Final Tour on December 31, 2015.